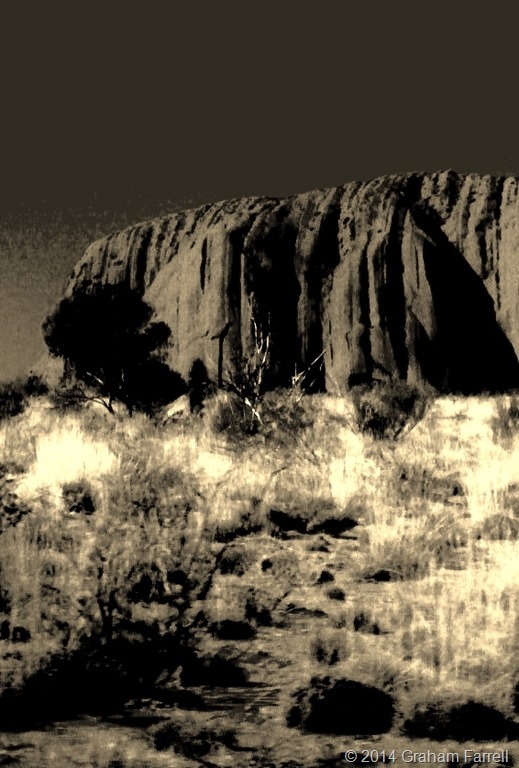 This striking eruption of earthly sorrow is only one of the stories that the Anangu people of Australia’s Northern Territory tell about the origin of Uluru (also known as Ayers Rock). 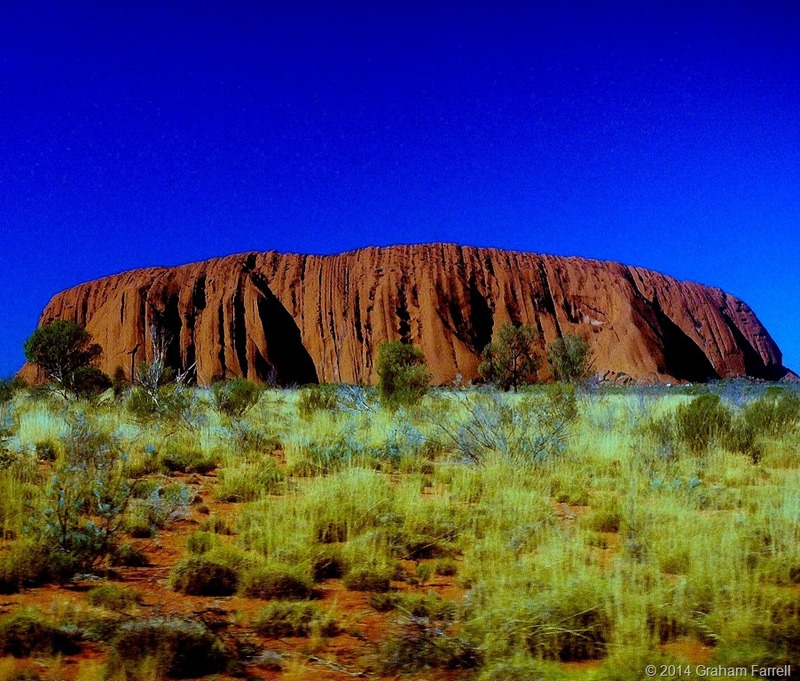 Uluru is a sacred place in their tribal land. It is now part of the Uluru-Kata Tjuta National Park, which since 1985 has been jointly managed by the Australian Government and the Anangu people. In Brockman’s version of the origin story he says that back in the time of ancestral spirits, two tribes were invited to a feast. But on the way, the guests became captivated by a group of Sleepy Lizard Women and lingered at a waterhole where Uluru now stands. The party hosts took umbrage at their guests’ nonappearance and, feeling insulted, sang evil into the mud they were moulding until it sprang to life as the dingo. Next, a terrible battle broke out and all the tribal leaders were killed. 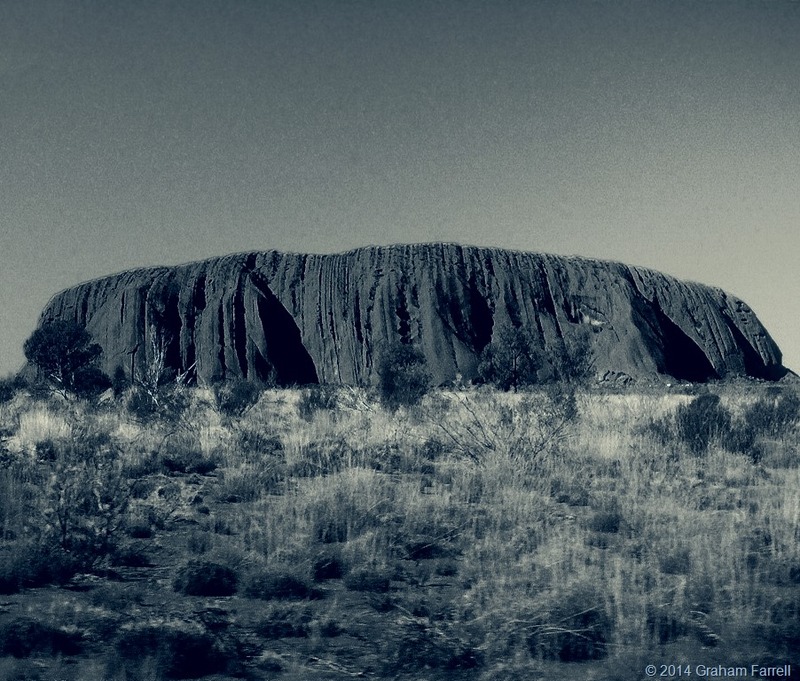 The spilling of their blood caused Uluru to rise up. Geologists will of course give another explanation. They will say that Uluru is an inselberg, literally an island mountain, a sandstone dome that is the sole remnant after the slow erosion of a mountain range. Tourist guides will tell you that it is Australia’s most famous natural landmark, that it rises over 300 metres above the flat desert scrub, that the tough trek to the top is 1.6 km, and the walk around the base over 9 kilometres. As I write these facts and figures, I feel myself becoming irritated. Surely they are not the point. I begin to see a little of why the Anangu people do not want people scrabbling all over the place. Come there, by all means, they say. But do not climb. Watch and listen. This is the place where several songlines intersect, and where many sacred ceremonies are performed. It is filled with great meaning and resonance. Genetic studies have shown that Australia’s indigenous people arrived in that land some 50,000 years ago. In all that vast expanse of time, and until the arrival of Europeans, their cultural view was presumably uninterrupted. They lived a hunter-gathering life well fitted to a demanding environment. There were people living around Uluru 10,000 years ago. What to European newcomers appeared utterly undeveloped and primitive, was rich in metaphor and codes of conduct. 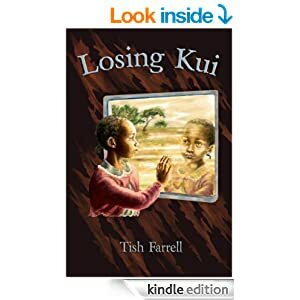 And if I have rightly understood what the Anangu people say (see the links below), then physical reality, metaphor, and time itself are meshed as one. Past, present and future are all part of the becoming that began with the first ancestral spirits. In the beginning, then, the earth was flat and featureless. Next came the spirit ancestors who took the forms of people and animals. In their wanderings across the surface of the world, they instigated acts of both creation and destruction. 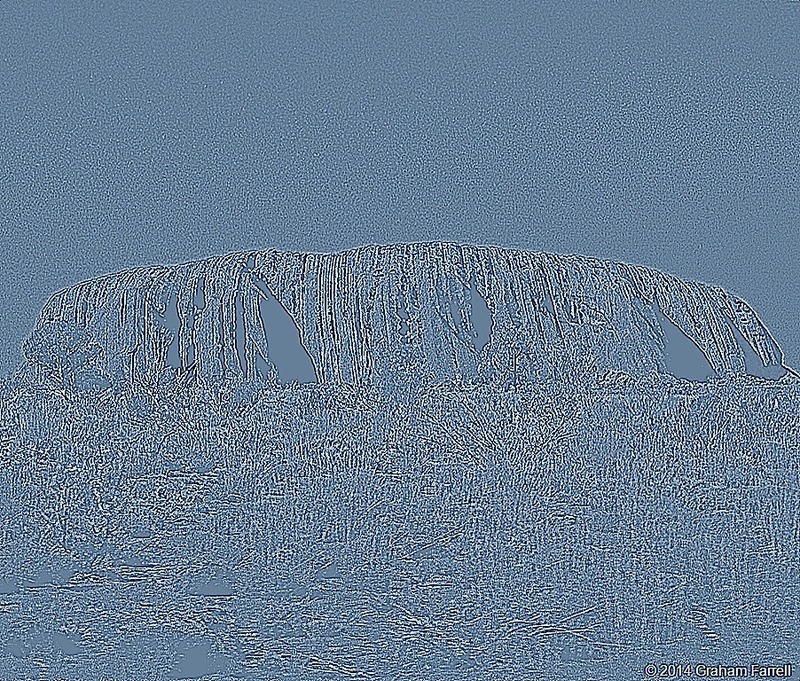 These brought into being the physical landscapes we see today. They are journeys of becoming, iwara or songlines, and through them was engendered the law, tjukurpa (chook-orr-pa). These are ethical pathways, ways of being and doing that honour the interconnectedness of all things; the relationships between plants, animals, humans and the land itself. The law is remembered and passed on by elders to the rightful inheritors through song, art, stories and ceremonies. One can see, then, why the Anangu people might feel that the word ‘dreamtime’ does not do justice to the meaning of tjukurpa (law). To the European mind the term suggests something fey and otherworldly. Yet in the physical sense Anangu law is absolutely worldly; it is about showing responsibility towards the land and all living things; honouring existence. This, I would suggest, is the kind of moral geography that we ‘Rich-Worlders’ could do well to acquire—and PDQ? Our trail of destruction across the planet speaks for itself. Our presumption of being ‘on top’ in the civilization stakes is more than a little flawed. We forgot a few hundred years ago to leave only our footprints. Posted on April 20, 2014 April 20, 2014 by Tish Farrell	This entry was posted in Heritage, Landscape, photography, Travel and tagged Anangu community, Australia, Ayers Rock, creation stories, Daily Post, DP weekly photo challenge, myth, postaday, Prehistory, sacred places, songlines, Tjukurpa, Uluru, Uluru-Kata Tjuta National Park. Bookmark the permalink. It’s such a multi-layered concept isn’t it, ‘dreamtime’ for us who are more used to separating everything out. It’s interesting, too, how similarly complex creation metaphors and concepts can be found in many different and far-flung cultures. Truly fascinating, Tish. The parallels between Australian history and our own are unmistakable. Whether Down Under or here in the States, we would highly object to rude or disrespectful actions in our places of worship. Why do we not recognize these spots as sacred and afford them the same respect we demand in our own? Until we do, I cannot see how we can claim that we view these people as our equals. Thank you for saying that, John. Ah well. Limited horizons, I suppose. First of all…Thank you Tish..I didn’t realise this site existed. Lovely photo’s and words. Interesting comments. Secondly, Ian B Cross…did you actually get to Uluru and experience the rock illuminated by the sunlight at dawn and at dusk?? Hello, Jean! Welcome to my blog. I enjoyed this post very much. And love your stories of indigenous peoples. There is so much to be learned from those who live and lived in harmony with the environment around them. There have been wonderful discoveries and inventions too, by so called civilized people, but though it’s all so human, it is regrettable that in our appreciation of new finds and inventions, we tend to throw away the wisdom of ages. You are right of course, Shimon. Life as a hunter would be rather limited technologically speaking. It’s a closed system. They have everything they want within it, unlike us who never seem to get to the end of the wants. But yes, within all that wanting marvellous things have been invented. I think it’s when we get above ourselves that the trouble starts – losing our respect for the world that sustains us, and thinking that science and technology can solve all our messes; or looking down on cultures that seem ‘primitive’ because possessions are unimportant. As always, I appreciate your observations.